What could be better than catching up with a great friend over a wonderful meal during restaurant week? (aka: at an incredible value. $35 for appetizer, entree and dessert) We began our evening with cocktails. Mine was a refreshing Olives’ signature drink with vodka, pineapple and ginger over ice with a sugar rim. I’m really not a drinker, this was my first drink in about 6 weeks, but it totally hit the spot on this 95 degree day. The bread basket, tapenade and olives were an excellent snack alongside of our drinks. Specifically, the caramelized onion focaccia was especially tasty. We shared both appetizer offerings. 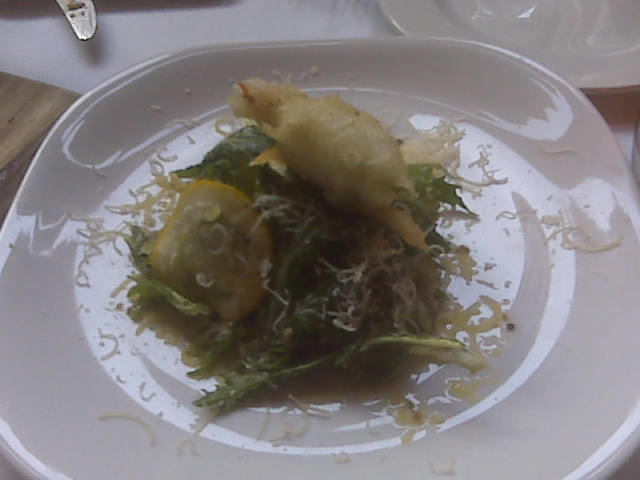 One was a light, summery squash carpaccio with Parmesan and a little tempura’d squash blossom stuffed with cheese. MMmmmMMMmm. 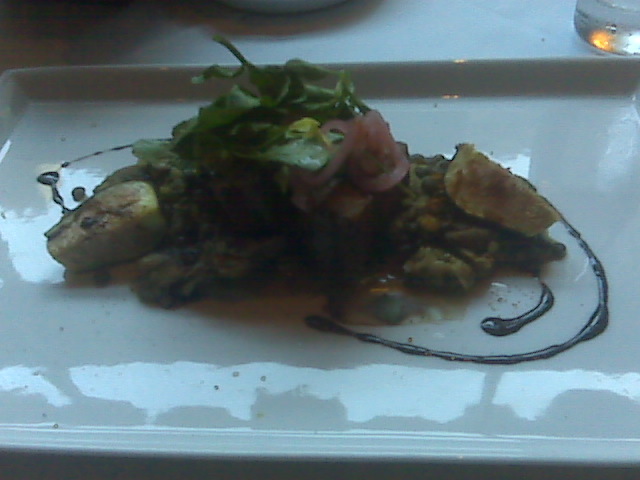 This was my favorite dish of the night. It tasted just like summer should. 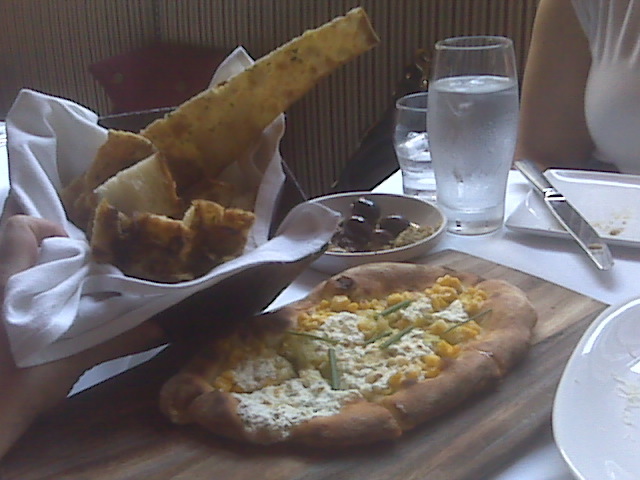 The other was a sweet corn and ricotta flatbread with leeks. Savory, sweet and salty with a great crunchy crust. I’m being especially picky by mentioning that I would have liked more corn and leek piled on top, it was mostly bread and cheese. It was still perfectly delicious the way it was though. My duck entree was slightly more cooked than medium, but If I remember right, I think I just told the waiter to have the chef prepare it as he/she saw fit. Though I didn’t love the lentils which were a bit salty, I thought the figs and the duck married beautifully and were a luxurious tasting duo. 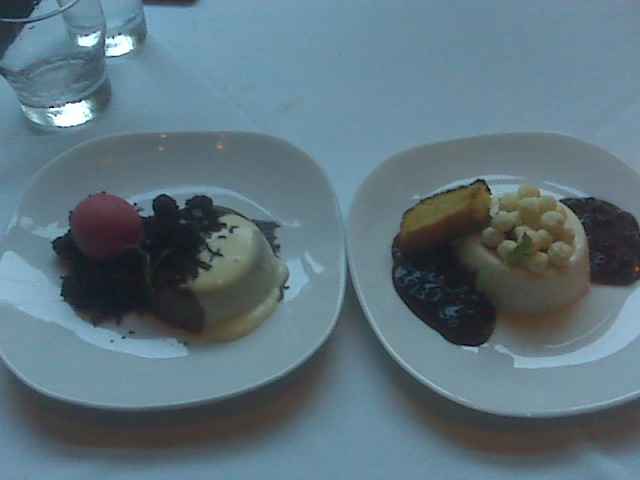 Desserts are something I always save room for. It is by far my favorite course of any meal. Tonight they were a total disappointment. We shared both of the restaurant week choices and were surprised to see how similar they were. Both were a gelatinous pudding-like substance with a sauce and some cereal thrown on top. The chocolate one, simply because it was chocolate, was the better one. It came with a lovely strawberry ice on the side atop a chocolate fudgy thing. That part was great. The rest? Not so much. The other one tasted like cheesecake flavored jello. On top was a handful of kix. Cute, but really? The blueberry sauce was the best part and I kind of wished I had something else to put it on. All in all, despite the dessert bummer, Olives was a top of the line choice. Beautiful setting, super convenient location, charming service (thanks Nathan!) and hip, creative ingredients and pairings. I will definitely put this one on my plan-to-return list.